Last time you varied one experimental condition that may affect the behavior of a given gold binder (pAu1). The change you made to the binding protocol may increase or decrease the yeast’s apparent affinity for its substrate or it may change the amount of non-specific binding, measured by its effect on the pCT-CON sample. Every yeast in the negative and positive control samples bear the pCT-CON or the pAu1 plasmid, respectively and should react identically to the new experimental condition. 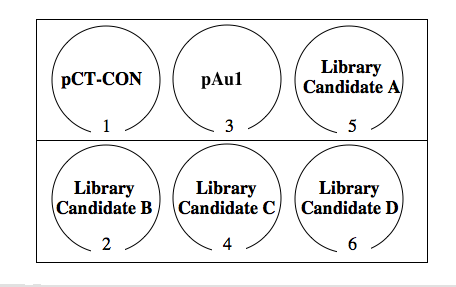 By contrast it's unlikely that all the candidates you identified from your initial library screen will bind gold equally well. The affinity will depend on the sequence of the Aga2 fusion protein and each yeast colony from the library could have a different sequence. In fact, some of the candidates may not really bind gold at all. For example cells that were trapped on the glass behind the gold slide would appear to have bound the gold in your initial screen. Today you will further evaluate four library candidates, re-examining their gold-binding ability and determining their relative affinity. Based on the results of your optimization experiment you may want to change the panning protocol. Alternatively, you can rescreen your four candidates under precisely the same conditions as they were first isolated. It is your choice to make (with your lab partner, of course), but be sure to keep notes on the protocol you decide to follow. Based on the results of today's experiment you will choose two of the four candidates to send for sequence analysis of the Aga2 fusion. Record the number of colonies that arose from the optimization experiment you performed last time. You should compare these numbers to the control samples in the library screen, for which you followed the “standard” protocol. Two days ago you examined the Petri plates from your library screen and, if possible, you moved four colonies into 4x 2.5 ml of glucose-containing media to grow at 30°C overnight. Yesterday a small amount of those cultures was moved to 5 ml of galactose-containing media to grow at room temperature. Control samples of pCT-CON and pAu1 were also induced. Now you should repeat the panning experiment with the controls and your four candidates. If you discovered something great with your optimization experiment, you might want to modify the standard protocol. Otherwise, follow the same procedure as you did for the initial library screen. One of the best ways to help frame the problem for yourself is to discuss it with someone new. While your yeast are incubating with the gold slides, you will have time to talk with a person from another lab group. This person will offer you a fresh ear to consider your proposal. Try to describe your research problem to them. Articulate why it's important. Tell them about some recent, relevant data. Describe what you're proposing to do and what the findings from your experiments might reveal. Throughout your discussion, keep careful track of the questions they ask since these will point you to the confusing concepts or fuzzy parts of your explanation or understanding. Then be a good listener to hear the proposal that they've been working on. Ask lots of questions. No questions are dumb. You are there to offer a naive ear and seek complete explanations. You will have time at the very end of class to reconvene with your own lab partner to hear how their conversation went. Try to identify repeated questions or concerns since these are probably the holes in the project as it stands. You can rework your proposal based on the conversations you've had. Prepare a figure of any digital photos you took this time. Again label your images and include a legend for the figure. Prepare a table presenting the plating results of your optimization experiment as well as a short description of the experiment to go with the table. You can include relevant data collected at other times or even by other people in the class if appropriate. Include enough information in the table legend so a person could understand the experiment. Suggested numbers of slides are listed here but the number may vary depending on the particulars of your proposal. You will have time to work on the presentation in lab next time as well as ask questions about the format, but you should begin to prepare, in powerpoint or similar presentation program, the materials you need. This page was last edited on 18 April 2007, at 07:58.